Q. I haven’t been to confession in a long time and don’t know what to do. I help out a lot at the parish so I know the priest will recognize my voice and I am afraid that every time we see each other, he will be thinking about the sins I confessed. What should I do? A. First of all, it’s great that you help out at the parish a lot. That’s a sign of your faith and your desire to serve God. Regarding confession, the easy answer is to simply go to a nearby parish and find a priest you don’t know. That’s not as convenient, but if that’s what it takes for you to comfortably go to confession then it is worth the extra effort! We have the custom in the Church of giving people the option of going to confession “behind the screen” for a reason. 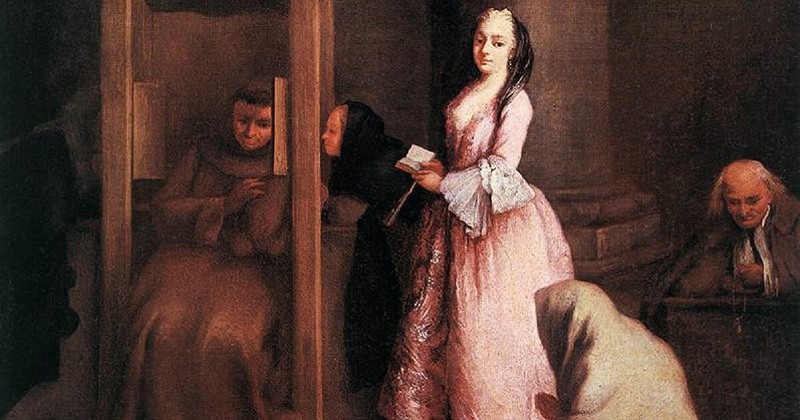 Some people enter the confessional with “fear and trembling” and, hence, find it easier to go anonymously. The important part of confession is not that you share personally with this or that particular priest. The most important part of confession is honestly and humbly confessing your sins and receiving sacramental absolution and forgiveness. If it takes finding a priest you don’t know, then go for it! But let me give you another perspective also. In addition to the primary purpose of confession (forgiveness and grace), some find a secondary benefit when they go to the same priest, face to face, on a regular basis. Truth be told, I think that we all, deep down, really do want to have someone who will listen to our personal struggles in a loving, non-judgmental and completely confidential way. We all long to have someone who can share our sufferings, enter into the secrets of our hearts (especially those that no one else knows! ), and heal the wounds we receive in life. I know that all of us could benefit from having a regular confessor who we feel very comfortable with and who gets to know us well. Most priests are very good at confession and are very good about listening, understanding, being non-judgmental and even offering some helpful and sound spiritual advice. And when you can establish a regular habit of going to confession, to the same priest, on a regular basis, you may be surprised to find out how beneficial it really is. First and foremost, you receive the grace of God’s forgiveness. But secondarily, because, over time, that particular priest will get to know you and can more easily act as a “spiritual father” to you. This is what priests are for! Don’t be afraid to let your priest play this important role in your life!! So most importantly, go to confession. And if you can get up the nerve, I would recommend you try going to your parish priest on a regular basis. Not only is it convenient if you are around the parish a lot, but also, if you establish that habit with your parish priest, I think you’ll find the opposite of your concern to be true. I bet you will actually be grateful that the priest you see, on a regular basis, is the one who understands and knows you very well. Give it a shot. I think you’ll be happy you did.